This was one of those favorite school box recipes. The kids loved it for years – and it was one of Meghan’s favorites so when she got married this year, I made it once again and it was just as popular. Cream butter and sugar. Add eggs, one at a time – beating well with each until the batter is light, creamy and fluffy. Add vanilla and banana. Mix until smooth. Combine flour, baking powder and baking soda. Add to butter, egg, banana mixture alternately with the sour cream. Spread half in a greased and floured 9×13 baking pan. 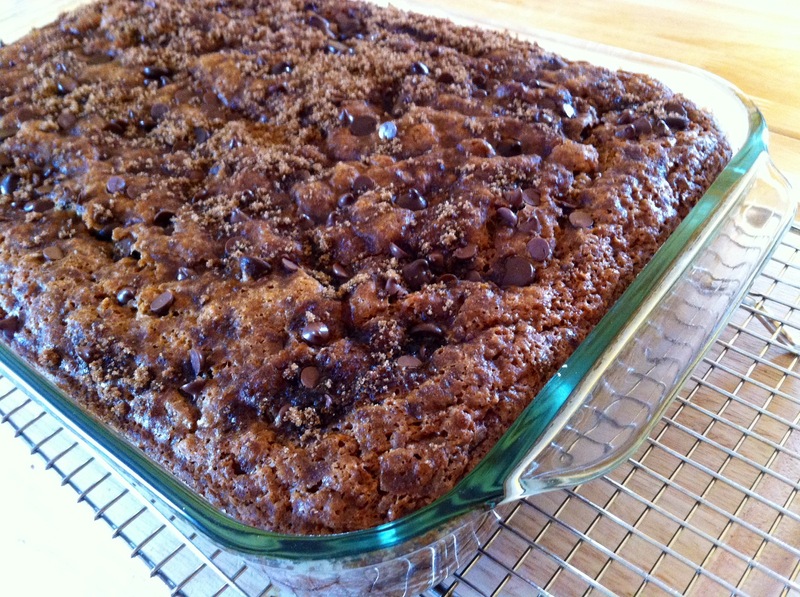 Sprinkle half the brown sugar, cinnamon mixture over and top with half the chocolate chips. Add the rest of the batter, and complete with another topping of brown sugar, cinnamon and chocolate chips. Bake at 350 for 50-60 minutes, until a toothpick – when inserted – comes out clean. 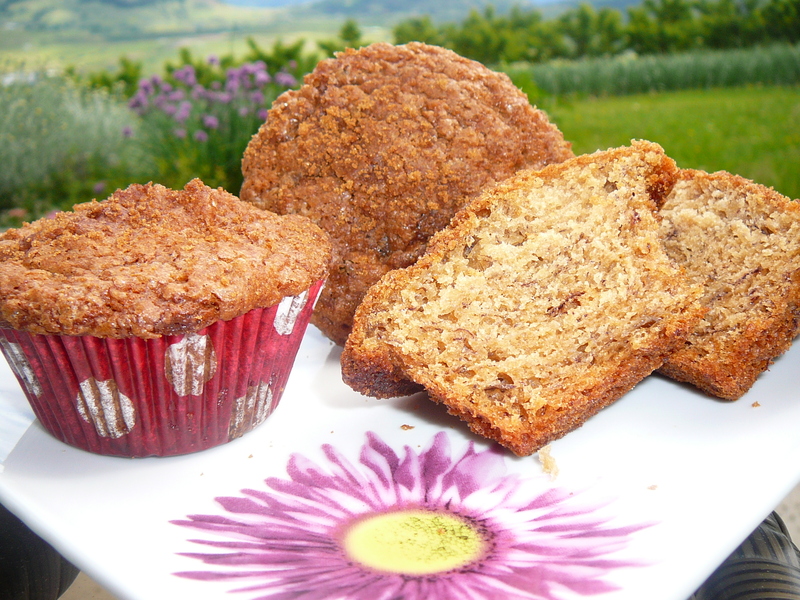 This can easily be converted to muffins if you don’t have enough over ripe bananas hanging around the kitchen counter …. today I only had half the bananas so I made 12 muffins by cutting the recipe in half. Fabulous …. 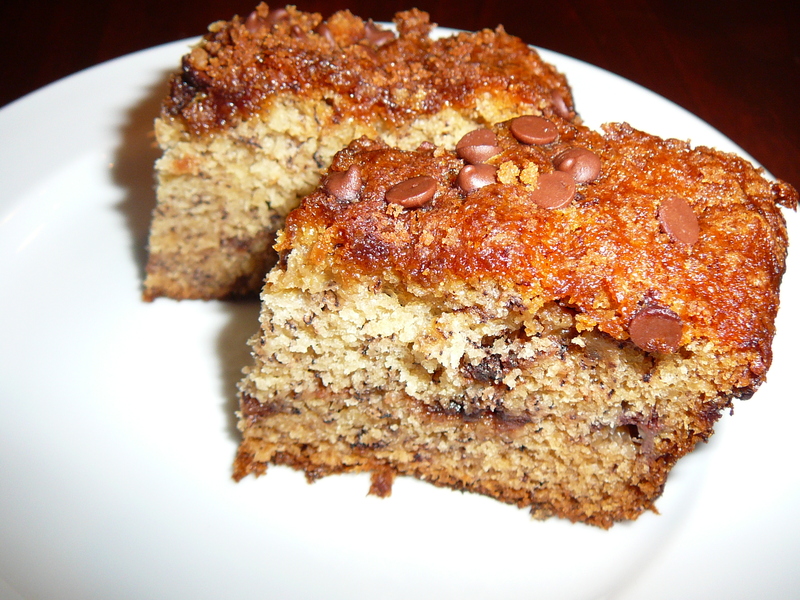 This entry was posted in Baking, Dessert, Recipes and tagged baking, bananas, brown sugar, cake, chocolate chip, cinnamon, dessert, lunch box, muffins by Chatty Kathy. Bookmark the permalink. This cake just keeps getting better – didn’t have quite enough banana, but I had made some apple sauce for baby Stella Rose, just enough to bump up the fruit to the 3 cups – so moist and delicious!